Home / Christmas / Gift Guide / Who Doesn't Love a Good Board Game at Christmas? Who doesn't love a good board game at Christmas? As a child nothing would make me happier than waking up Christmas morning to opening all the gifts around the tree to discover a brand new board game. We had quite the collection at my grandparents house and I have so many fond memories sitting up the table with a glass of Cherryade, laughing and giggling with them both. Board games are such a great way to bring out your competitive side while having fun with family and friends, it's also a good way to break the ice and encourage guest to mingle with one another. With that in mind, I wanted to share a few classic games that we will be playing with our families this year as well as a few new ones that will sure cause a stir. Let's begin with the retro board games. Scrabble, who doesn't love scrabble? It is the world's most popular word game where players attempt to build interlocking words on the board, using letter tiles with various score values. The object of the game is to get the highest score. Each player competes by using their tiles in combinations and locations that take best advantage of letter values and premium squares on the board. Othello* is another classic, a minute to learn...a lifetime to master! The two player strategy game. Trap and capture opponent by placing your disks on the board. "Sandwich" at least one of your opponent's pieces to turn their disk to your colour. 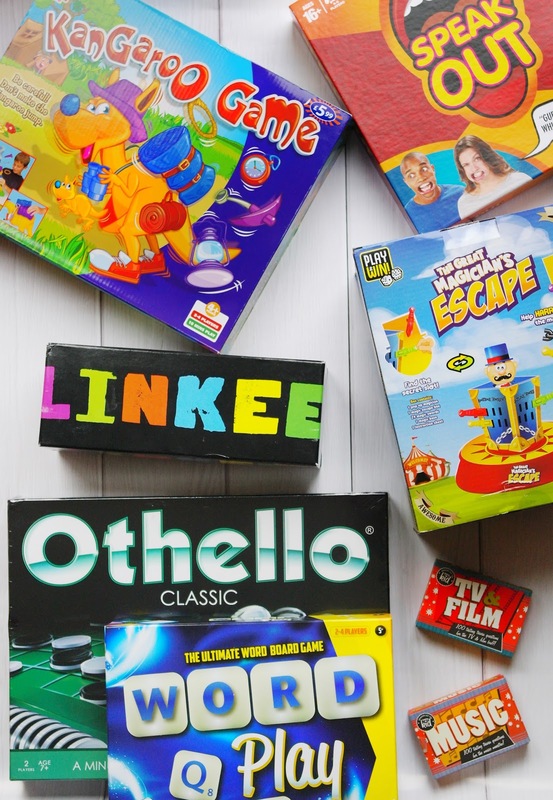 You can get your classic Othello Argos, The Entertainer, John Lewis, WH Smith, ToyMaster. As a stocking filler a deck of card is always going to be a good idea, as there are so many different card games that you can play and for less than £1 it's pretty budget friendly too. Love it or hate it, Monopoly has to be added to this list of classic board games. There are so many versions of the game that I am sure you'll find one to suit you and your family. Another game that my family enjoys is Linkee which is the super-simple, ‘shouty-outy’ family quiz game that does things a little differently to other games. It's easy to learn, answer four questions, then work out what links those answers and shout 'linkee'. Get it right and win a letter, win enough letters to spell LINKEE and you win the game. You don’t have to be a trivia genius to be good at Linkee, you don’t even need to know the all the answers to play along. It’s all about making connections and taking risks. It only takes two minutes to learn and 30 minutes to play, you'll never get bored with 100s of questions inside. Is really isn't Christmas without a few trivia questions around the table. You can always pick up some trivia cards for less than £3 making the perfect stocking filler for someone. This year we have picked up two: One has been designed for the TV & Film buff and the other we decided to pick is for the music enthusiast making sure that there is something for everyone. You can pick up Trivial Pursuit the family edition, making it fun for all ages. Roll the die and rack your brain for the answers to questions in the category you land on. You'll earn a wedge if you're on the right space, and if you're the first to earn all 6 wedges, you win! With question-and-answer cards for kids and adults, everyone can enjoy testing their memory. Now let's talk about a few games for the younger families. One game that I asked for and became pretty obsessed with quickly was Who Wants To Be a Millionaire. I do think that if I went in search of it I would find it collecting dust in my parents loft, but there were a few others that I also loved playing such a Frustration, Ker-plunk and Buckaroo! when we were shopping the other day I discovered a similar one, Kangaroo Game where players take turns to hang the travel kits on the kangaroo without letting it jump. The Great Magicians Escape is a game that I am sure that our daughter will love, and I am sure many other children will too. Harry H is waiting to pop in the Great Magician's Escape Game! Take turns pushing swords into the box to be the first to make the magician pop out. The tension can become unbearable as you begin to run out of swords. A game that became something that everyone wanted to play is Pie Face which is fast action game filled with fun and suspense for the whole family. Just put whipped cream or a wet sponge on the hand of the game unit and turn the handles. It could go off at any time, so keep your fingers crossed it's not you. You score a point for every time you turn the handle without getting pie-faced, and the one who scores 25 points wins. Now there is a newer version Pie Face Sky High where One player stands, looks through the mask, and faces the throwing arm. The other player hits the base plate with the plastic hammer hard enough to "pie" their opponent! The game has an easy-to-adjust difficulty setting, making it fun for young players and adult. So what games will you be playing this year? You'll have to let me know if there are any treasures that I have left out in the comments below. 10 comments on "Who Doesn't Love a Good Board Game at Christmas?" What is Christmas without board games! I absolutely love board games, but growing up my mum and sister hated them, and would only play at Christmas time. Luckily every Christmas I put a new board game on my Christmas list and we got to play that! I think board games bring families closer together, it takes you all off sitting on your phones in the evening, and actually produces some great bonding! I’m a board game lover too! Monopoly is my all time favourite but everyone else in my family hates it haha! I can’t wait until Tyler is old enough to play board games! So, last year, I got monopoly and my mum got cluedo. Hours and hours of fun for us adults and my teenage nephews!